Most famous for its thermal spa, Morahalom is a delightful town in southern Hungary. For a long time Hungarians have been descending on the town to enjoy its healing waters, with the baths being granted official medical status at the end of the 20th century. Full of charm and character, our selection of the best places to stay in Morahalom reflect the town's strong tradition of hospitality. Dip down into the St Elizabeth Thermal Spa to ease any aches and pains or just to enjoy the warming temperatures. Take a trip to the Strudel House where visitors can learn to make traditional Hungarian strudels. The recently renovated Wine House is a great place for visitors to sample some of the region's delicious wine. Visit the Sand Ridge Memorial House which reflects the history and heritage of the town. This is not a tourist hotspot so our selection of the best places to stay in Morahalom are small, intimate affairs. At first glance, Homoki Lodge seems like a 19th century farmhouse but after closer inspection there's something a lot more interesting going on here. The rooms are actually luxury yurts in the garden and combine a chic aesthetic with a intimate ambience. The best place to fly to for Morahalom is Budapest (112 miles). Having a car to explore Morahalom and the surrounding area is advisable. We recommend visiting our online partner Rentalcars. The best time to vist Morahalom is from May to September, when the temperatures sit comfortably in the twenties. Browse our list of the best places to stay in Morahalom. 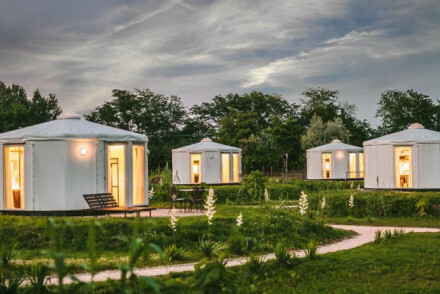 19th century farmhouse hotel with luxury yurts. Rooms in the hotel feature beamed roofs, and yurts have stone floors, lovely bathrooms and sumptuous beds. Larger suite available. Spa, private hot tubs, natural pool, and cosy lounges. Restaurant offers Austro-Hungarian menu. Secluded and unique.